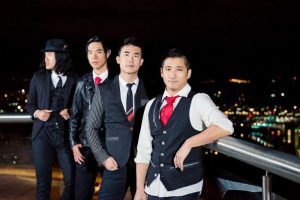 On Monday, May 1st, CincyIP will be hosting an exclusive event featuring Simon Tam of The Slants in the courtyard of Arnold’s Bar and Grill in downtown Cincinnati from 4:00 PM to 5:15 PM, with a special live acoustic show afterwards starting at 5:15 PM. Ken Germain of Wood Herron & Evans will begin with an introduction to “matter which may disparage…persons…[or] institutions” in the context of U.S. trademark law, and the legal background of the In re Tam case to date. Next, Simon Tam from The Slants will discuss his experience with the IP legal system, from the TTAB to the Federal Circuit, and now on to the Supreme Court. The CLE will conclude with a panel discussion by Lori Krafte (Wood Herron & Evans), Karen Gaunt (Dinsmore), and Prof. Tim Armstrong (University of Cincinnati College of Law) on the 1st Amendment issues, trademark concerns, and future implications that this case brings. At the close of the CLE, Simon will play a LIVE acoustic set featuring music from his band, The Slants. REGISTER HERE by noon, April 26. Read the Federal Circuit’s decision HERE. Listen to The Slants for free via their website HERE.